Home › Pro Wrestling › Remember When Mick Foley Fell off The Cell? Remember When Mick Foley Fell off The Cell? 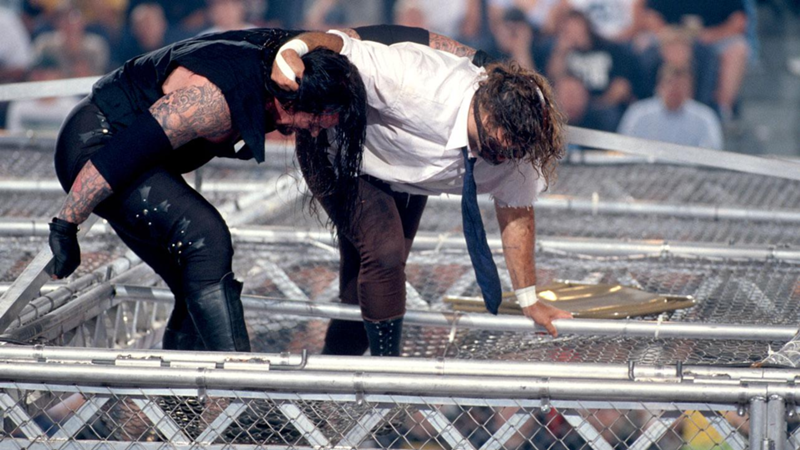 Do you remember where you were when the Undertaker threw Mankind off the top of the Hell in a Cell? I do, and I’ll never forget it. It was the June of 1998 and I had just finished my junior year of high school. King of the Ring was moments away, and I had earned a little extra money with my summer job in order to purchase it on pay-per-view. My house was ground zero for pay-per-view events, even though my parents didn’t like a lot of people over the house on Sunday nights. I invited my buddy Wayne over to watch the event and I swore to my parents that he would the only attendee. Sure enough, however, Wayne asked if two of his friends could come over. I ran it by my Mom and she said yes, although my asking her went over like a fart in church. That night when the doorbell rang, I answered, and not 1, not 2, but 8 (!!) people walk through the door in single file. I was mortified and I just knew I was going to hear about it later! Luckily, the super mark in me made me forget about my impending doom as the Headbangers & Taka Michinoku went over on Kaientai in the opening match. The King of the Ring tournament itself was of most interest to me because I was jones-ing for a Ken Shamrock vs. Dan Severn final. However, The Rock would mess up those plans and he eventually lost in the finale to Shamrock. Hell in a Cell was next and none of us knew what to expect. The match began on top of the cell, and we all know what happened next. Foley plummets to the floor and the ten of us rose to our feet as a collective “Whoa” resonated from my room. My Mom rushed into the room to see if we were ok, only to witness a sea of flabbergasted teenagers! I quickly mumbled, “Undertaker threw Mankind off the top of the Cage”, so I could get back to watching the show. Moments later, Foley falls through the cage and another collective “Whoa” causes my Mom to rush into my room, again and again, I had to quickly mumble what happened so I could get back to the show. Foley gets slammed into an insane amount of thumbtacks which causes the third collective “Whoa” that prompted my Mom to rush in again. I waved her away because I didn’t want to miss another second. She didn’t have to say anything, because her eyes told me how much hot water I was in. The show closed with Kane going over Steve Austin for the WWF champion, my friends leave, and I’m a dead man walking. Much to my surprise, with a smile, my Mom asked me how the event was and I reviewed every match for her as if she knew who all of the wrestlers were. Punishment was spared, and I couldn’t have been happier if I had just experienced wrestling nirvana. The King of the Ring has always been one of my favorite events because the concept often marked the coming of a new main eventer. With all the gimmick pay-per-views the WWE puts on these days, I just don’t know why they would put this one on the shelf. Wrestling was such a passion of mine as a teenager that I often found my defending its honor whenever someone uttered those infamous words “You know it’s fake”. Yes, I know it’s not a legitimate competition, but it always bothered me how people would easily dismiss how hard the wrestlers work to entertain an audience. My VHS copy of King of the Ring 1998 became the most borrowed tape in my collection as I let people borrow it in order to change their minds and convert them to the dark side. It worked more often than not, and the key ingredient was the Hell in the Cell match as the images of Mick Foley falling off the cage is something no one will ever forget.